Drive Medical Duet Transport Wheelchair Rollator Walker from HealthyKin.com combines the features of a rollator and transport chair in one unit. An individual can ambulate independently or be pushed safely by a care giver. The Duet has locking flip up armrests and a flip down footrest to aid the user while the Duet is used in the transport chair mode. A safety lock release is used to store the arms and a velcro strap is used to store the footrest while using the Duet for ambulation. The tool-free two position contoured padded back rest is reversible depending on whether you are using the Duet in an ambulatory or transport chair mode. 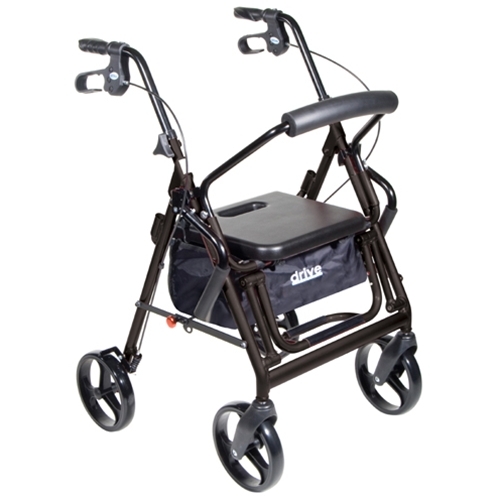 Overall this is one of the best well designed and built walkers and transport chairs I’ve seen. It folds up easily and fits in the trunk of small cars, doesn’t weigh too much. It fits through the average house doorway with no problem. My wife loves it as a walker. But it does have one major drawback, the seat is too narrow. It is only 13 1/2 inches wide. The average mature American female is much larger than that. The seat needs to be at least 17 or 18 inches wide to be comfortable to sit in for any length of time. Hope you come up with a slightly wider one without increasing the weight too much. I am having trouble walking and in order to get better, I have to walk more. This Drive Rollator is just what I needed. Makes walking so much easier. We take it to the Mall and I walk and walk. When we received this Rollator, it was in perfect condition, and the price from this Company was the best I could find. Very happy with this purchase. I'm so very pleased! I have severe nerve damage in my feet and cannot be on them for extended periods if time. I can use it as a walker to relieve some of the weight on my feet. For further distances, I can use it as a wheel chair. 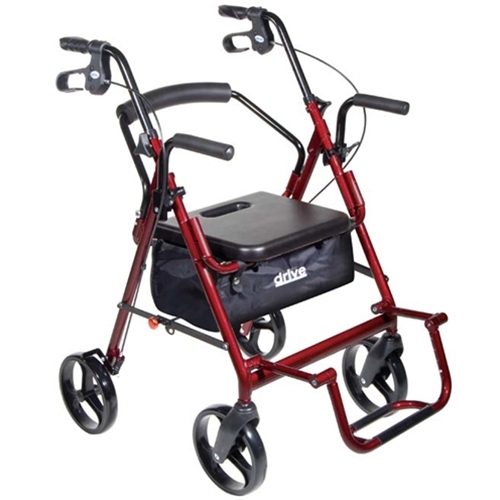 I am 100% pleased from the ordering process and shipping time, to using this great rollator. Exactly what I needed. This rollator is sturdy and feels much more stable to me than a lighter weight one I own. The brakes are more effective than some others. The pouch under the seat is large enough to hold a number of items, so it's great for moving stuff from room to room and to take shopping and be able to put packages and my purse under the seat. I like the extra sense of security that the transport wheelchair option gives. It's really easy to make the modification on the spot and have someone push me when I run out of steam during an outing. Great delivery time. Simple to assemble,light weight, every thing as advertised. I am so happy with this! Really well built. The seat is a little high off the ground so be sure you have at least one of the brakes on when getting in it or out of it, so you don't tip over. Love it!